The Maruti Suzuki Ciaz, Hyundai Verna and Honda City will soon have a new competitor in their midst – the Toyota Yaris. 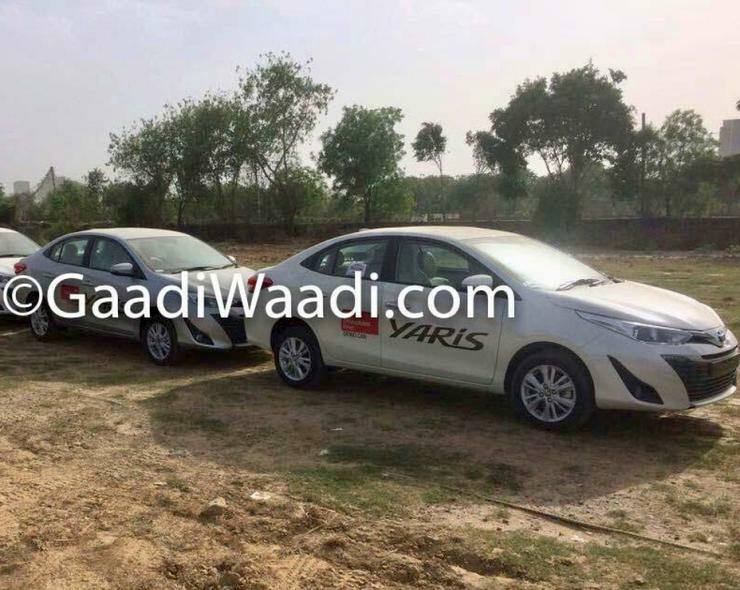 Demo cars of the Yaris have already started arriving at Toyota dealerships around India, ahead of the car’s May 2018 launch in India. Bookings for the Yaris are now officially open at all Toyota dealerships across India. The car will be positioned between the Etios and Corolla Altis in terms of price and positioning. Toyota aims to sell the Yaris as a premium, feature rich C-Segment sedan. Prices are likely to start from around Rs. 8 lakhs and those who want a diesel C-Segment sedan need to look away now. The Yaris will be a petrol-only car and Toyota has no plans to equip it with a diesel engine even in future. The petrol motor on the Yaris is a 1.5 litre-4 cylinder, naturally aspirated unit with 108 PS and 140 Nm. This engine will be paired to a 6 speed manual gearbox or a 7 speed CVT automatic gearbox depending on the variant chosen. 7 airbags will be standard across trims and so will be the case with ABS and EBD. This will make the Yaris one of the safest C-Segment sedans in the country. Other safety features on the higher trims of the Yaris include a tyre pressure monitoring system, hill hold, front proximity sensors, reversing camera and sensors, and a electro-chromic inner rear view mirror. The car, which is known as the Vios in some international markets, will get a range of creature comforts. The notable ones include ambient lighting, roof mounted AC vents, electrically adjustable driver’s seat and a gesture sensing, touchscreen infotainment system. The car is larger than a Hyundai Verna in terms of dimensions but is slightly smaller than the Honda City and the Maruti Suzuki Ciaz. It’s expected to be priced between the Ciaz and City.